L 19″ (48 cm) W 42″ (107 cm). Wailing “ka-aaow,” or piercing “tok-tok” cries. Description: Sexes similar. 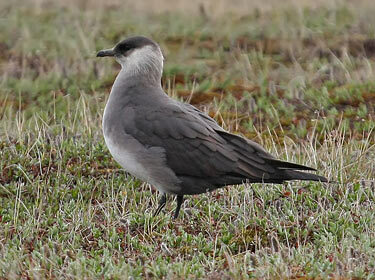 Smaller and more slender than Pomarine Jaeger; faster wing stroke. 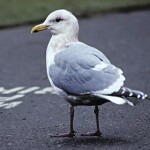 Longer central tail feathers are pointed. Light phase brown above; white below; black cap; yellow wash on throat; brown breast band; lacks barring on flanks. Dark phase uniformly brown. Juvenile is brown with black barring overall. 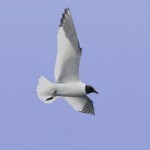 Habitat: Nests on the tundra, and spends the rest of the year on the open ocean. Where in Nebraska: Accidental. Early record from Lancaster County in 1898, and more recent specimen from Sheridan County collected in 1968. Fun Facts: Highly dependent on lemmings, the Parasitic Jaeger will abandon breeding areas when lemming numbers are low (about every 4 years). Additional Information: Jaeger comes from the German word for hunter, as they are predatory on their breeding grounds. 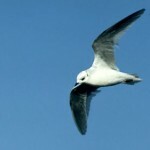 They become pirates on the ocean and often rob other seabirds of their prey.